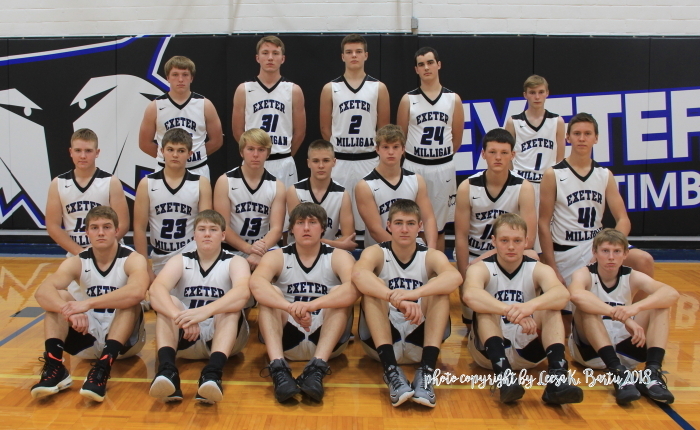 Exeter-Milligan Boys Basketball team. Front row from the left: Mitchell Manning, Theron Odvody, Johnny Babula, Spencer Pribyl, Colton Bossaller, and Trever Zelenka. Middle row from the left: Casey Underwood, Peyton Pribyl, Braden Capek, Kole Svec, Dylan Bonds, Jackson Beethe and Clint Oldehoeft. Back row from the left: Max Zeleny, Ryan Sharp, Luis Jaegermann, Elijah Johnson, and Mason Kelly. Seniors from the left: Mitchell Manning, Johnny Babula, Spencer Pribyl, Colton Bossaller, Theron Odvody and Trever Zelenka. The Timberwolves open their season tonight in Deshler and will be home on Friday night against Osceola.